Jumanji: Welcome to the Jungle: An actually enjoyable movie?!? 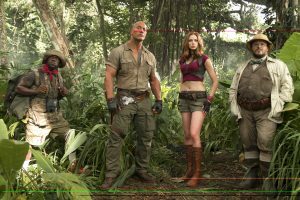 Color me surprised…if you are looking for a movie to see other than Star Wars: The Last Jedi before the end of the year, you should consider Jumanji: Welcome to the Jungle. It was a very enjoyable, laugh out loud funny film. And I didn’t expect that at all. What did I expect? Ever since it was announced with the cast, I was thinking it would be worth watching maybe when it came to cable. Not because I didn’t like the cast – I’ve enjoyed watching Dwayne “The Rock” Johnson in most everything, and of course there’s Karen Gillan, and throw in the comedic talents of Jack Black and Kevin Hart – but it was going to be a sequel to the original Jumanji film that starred the late Robin Williams, and I couldn’t see how anyone could do a film in the style of Robin Williams without him. But I was able to attend an advanced screening of the movie (a rare thing since I don’t live anywhere near where movies traditionally premiere), and what I saw was a different style of film that paid tribute to the original and Williams himself, but stood on its own playing on the different strengths of the cast members. Quick plot description – these are not spoilers of you’ve seen the trailers…in 1996, there is another disappearance in the town of Bratford. A teenager found a copy of Jumanji, but it transforms itself into a video game cartridge, which he begins to play and disappears. 20 years later, four high school teens (of a somewhat stereotypical “Breakfast Club” group – a nerd, a jock, a hot girl, and an awkward girl) while serving detention come across a game console with the Jumanji cartridge still in it, and turn it on. They select their game characters (of generally opposite characteristics to themselves), and are transported into the game and into their chosen characters. They then must figure out and win the game – before they run out of lives. The plot itself was generally predictable, as was some of the dialog. However, it was the execution that really made this movie good. It was the actors, playing video game characters that you could see each playing, but playing them as the complete opposite – Johnson playing a geek playing the strong, smouldering hero-type, Gillan playing an awkward girl playing the Tomb Raider-esque martial artist, Hart playing the jock playing the hero’s valet, and Black playing the hot girl playing the (male) archaeologist – is what really made this movie. Of course, that last part also allowed for some humorous dialog revolving around the male anatomy, but it IS rated PG-13. Jumanji: Welcome to the Jungle opens Wednesday, December 20th – just 5 days after Star Wars: The Last Jedi. So to help you recover from the shock of that movie, catch this film to pick you back up.